Between September 2010 and January 2012, a total of 2,282 families (including over 5,000 children) were enrolled into the study from emergency shelters across twelve communities nationwide and were randomly assigned to one of four interventions: 1) subsidy-only – defined as a permanent housing subsidy with no supportive services attached, typically delivered in the form of a Housing Choice Voucher (HCV); 2) project-based transitional housing – defined as temporary housing for up to 24 months with an intensive package of supportive services offered on-site; 3) community-based rapid re-housing – defined as temporary rental assistance, potentially renewable for up to 18 months with limited, housing-focused services; or 4) usual care – defined as any housing or services that a family accesses in the absence of immediate referral to the other interventions. Families were followed for three years following random assignment, with extensive surveys of families conducted at baseline and again approximately 20 and 37 months after random assignment. The results are discussed in a symposium of 15 short commentaries appearing in Cityscapes (2017, 19:3), a journal published online by the US Department of Housing and Urban Development. Here are some comments from the introduction to the symposium written by Anne Fletcher and Michelle Wood, "Next Steps for the Family Options Study." "The study findings suggest that families who experience homelessness can successfully use and retain housing vouchers, and that by doing so families experience significant benefits in a number of important domains. Importantly, the study also demonstrates a compelling set of positive outcomes that directly benefit the children in families offered a long-term rent subsidy, including reductions in child separations (observed at 20 months); psychological distress of the family head (observed at both time points); economic stress (observed at both time points); intimate partner violence (observed at both time points); school mobility (observed at both time points); behavior problems and sleep problems of children (observed at 37 months); and food insecurity (observed at both time points). ... The striking impacts ... provide support for the view that, for most families, homelessness is a housing affordability problem that can be remedied with long-term housing subsidies without specialized services." Some caveats are in order. This study is focused on homeless families with children, not on homelessness affecting single adults. I am not aware of a specific cost-benefit study of these results, comparing how much the long-term rent subsidies cost, compared both with the level of public services typically used by families in homelessness and the additional benefits of this approach. But the evidence certainly suggests that it would make sense to transfer some of the current resources being used to assist homeless families into straightforward rent subsidies. What's Next for Mass Transit? "After adjusting for inflation, transit agencies have spent more than $1.6 trillion on operations and improvements since 1970, while collecting less than $500 billion in fares. Per passenger mile, transit is the nation’s most expensive and most heavily subsidized form of travel. In 2015, transit agencies spent an average of $1.14 per passenger mile, while Amtrak costs averaged nearly 60 cents, driving averaged about 26 cents, and flying averaged about 16 cents per passenger mile. Of those costs, transit subsidies averaged 87 cents per passenger mile, compared with about 30 cents for Amtrak and less than 2 cents for flying and driving." O'Toole also mentions the more general problem that over time, jobs and housing have become more spread out across cities and suburbs, which makes it harder for mass transit to function. Indeed, one useful question to ask of any mass transit system is whether people can get just about everywhere they need to go, with relatively little need for a car or a lot of taxi or Uber rides, or whether the transit system mainly helps people from the suburbs get in and out of the city some of the time--while driving the rest of the time. "Boston’s Massachusetts Bay Transportation Authority and Sacramento’s Regional Transit District both have unfunded obligations that are more than double their operating budgets. The Maryland Transit Administration, New York’s Metropolitan Transportation Authority, Portland’s Tri-Met, and the Washington Metropolitan Area Transportation Authority all have unfunded obligations larger than their annual operating budgets. The Southeast Pennsylvania Transportation Authority (SEPTA) and Rochester Regional Transit Service (RTS) both have unfunded health care obligations that are nearly as large as their operating budgets and, when pension obligations are added, are likely to be larger. Most of these agencies also have large debts and/or maintenance backlogs. "Census data reveal that a higher percentage of people who earn more than $75,000 a year take transit than any other income class. To the extent people believe that low-income people can benefit from transportation assistance, such assistance should be in the form of vouchers (similar to food stamps) that can be used with any transportation provider, from a ride-hailing service to an airline." "[T]ransit agencies should begin to prepare for an orderly phase-out of publicly funded transit services as affordable, shared driverless cars become available in the next decade. This means the industry should stop building new rail lines; replace most existing rail lines with buses as they wear out; pay down debts and unfunded obligations; and target any further subsidies to low-income people rather than continue a futile crusade to attract higher-income people out of their cars." Even I, gloomster though I am, am not as gloomy about mass transit as O'Toole. But the neglect of physical maintenance, the lack of planning and funds for needed large-scale updating, and the accumulation of unfunded liabilities are real problems. I'm also a much bigger fan of buses than rail for most cities (remembering that buses can run both on dedicated lanes and also on regular streets). Also, I'm not as confident as O'Toole that driverless cars are right around the corner. But a different technological possibility that is very near is a network of ride-sharing vans, perhaps with a capacity of about 10 people each, whose routes would be continually updated, coordinated and optimized. For a study of the possibilities of such a system in the context of New York City, see the article by Javier Alonso-Mora, Samitha Samaranayake, Alex Wallar, Emilio Frazzoli, and Daniela Rus, "On-demand high-capacity ride-sharing via dynamic trip-vehicle assignment," Proceedings of the National Academy of Sciences (2017, 114 (3) 462-467; published ahead of print January 3, 2017). Back in the late 1990s there was a mini-argument about whether something should be done about the run-up in the stock market. As a reminder, the Dow Jones Industrial Average was at about 4,000 in spring 1995, but reached 11,700 by January 2000. On one side, there was an argument that financial regulators or the central bank should do something to slow down or limit the rise. On the other side, the standard argument at the time (with which I agreed) was that: 1) giving government the power to decide an "appropriate" level for the stock-market seemed unwise for several reasons; 2) acting to choke off the stock market raised a danger of creating a near-term recession; 3) even if/when the bubble burst, the effects of a stock market collapse on the real economy would be muted. Indeed, the 2001 recession was fairly shallow and only eight months long, and while unemployment continued to rise for a time after the recession had ended, the monthly rate peaked at 6.3%. This earlier experience represented how many economists mostly thought about the relationship between asset prices and the economy at the turn of the 20th century. Sure, there was a connection from asset prices to the economy, and asset prices could display bubbles that inflated and burst. But a common feeling was that policymakers who were thinking about macroeconomic policy shouldn't become too distracted by the fizzing and popping of asset markets or housing prices, and should instead focus on the real economy of output and unemployment rates. The Great Recession of 2007-2009 showed the deep inadequacy of that kind of thinking. 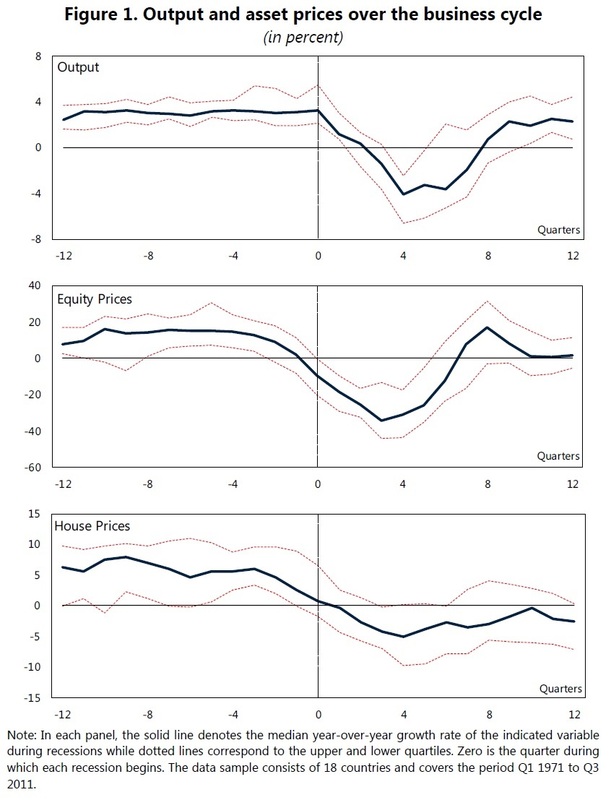 In particular, it showed that even if rises and falls in stock market prices should not be a top public policy priority (because for many owners of stock, paper gains and losses have only a modest effect on their other economic behavior), when asset market involve debt, housing prices, foreclosures and bankruptcies, and the banking sector, a crash in asset prices (like housing and housing-related financial instruments) can bring on a deep recession. For those wishing to get up to speed on the issues of asset prices and the real economy, Stijn Claessens and M. Ayhan Kose offer a useful overview in "Asset prices and macroeconomic outcomes: a survey" (November 2017, Bank for International Settlements, Working Papers No 676). There is of course a two-way interaction here: asset prices respond to changes in the real economy, and the real economy responds to changes in asset prices. But there's a lot of work to be done in spelling out these connections. Assets prices fluctuate a lot, and more than real activity. Here's a figure from the report showing the average patterns of output, stock market prices, and housing prices for a group of 18 countries over the period from 1973-2011. The "zero" on the horizontal axis is when a recession started, so the figure shows the average patterns before and after the start of the recession. Notice that in a typical recession, the level of output falls by about 4%, but the average stock market decline (which usually starts before the actual recession) sees some quarters where the decline from the previous year is more like 30%. Housing prices typically fall in recessions, too. The question of why asset prices should move so much, given that these patterns have been common across a large number of countries and thus seem reasonably predictable, is not clear. "[I]nvestment and consumption respond differently to asset prices from what standard models would suggest, with a larger role for “non-price factors” in driving agents’ behaviour and macroeconomic aggregates. 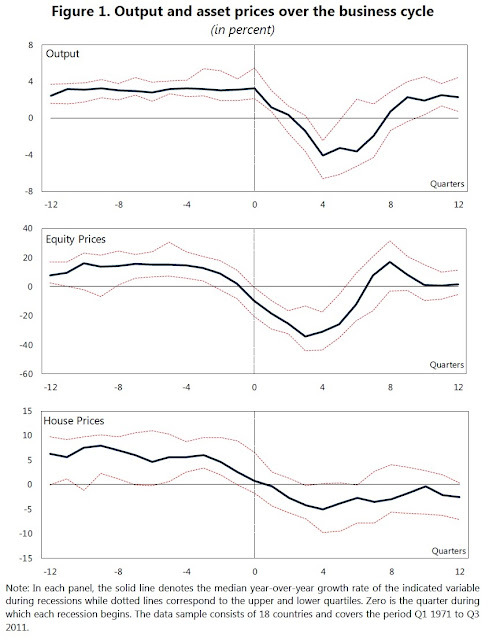 Firm investment reacts less strongly to asset prices than predicted by models while household consumption reacts more vigorously to changes in asset prices, especially house prices, than consumption-smoothing models would suggest. In addition, the links between asset prices and macroeconomic outcomes appear to vary across countries depending on financial, institutional and legal structures. Research also questions the strength of the direct impact of interest rate changes on activity and highlights its dependence on the state of the economy and the financial sector, and institutional arrangements. Recent studies emphasize the importance of uncertainty (measured among others by the volatility of asset prices) in explaining macroeconomic outcomes." Just to complicate matters one step further, the Great Recession also brought the widespread further complicated by the use of unconventional monetary policies like quantitative easing and even negative policy interest rates, as well as by international dimensions of policy like how movements of interest rates across countries can lead to fluctuations in exchange rates and even a risk of international debt crises. "Many current policy questions focus on macrofinancial linkages. These include the implications of UMPs [unconventional monetary policies] for the real economy and financial markets, including overall financial stability. A better assessment of the role played by monetary policy during a liquidity trap and the implications of UMPs on activity are of essential interest. In addition, the role of the exchange rate as a monetary policy target (possibly in addition to the inflation rate) needs further investigation, especially for the design of policies in small open economies and EMEs [emerging market economies]." When I think about dangers faced by the US economy, I find that I no longer worry much about a rise in inflation, which would have been one of my main 20th century concerns, and now I worry instead about whether a potential crisis is lurking in the nooks and crannies of the financial system. Progressive Redistribution: What's Happened? What's Next? Is the rise in economic inequality around the world during the last few decades mainly a matter of economic forces that have affected wages, or a matter of political forces that reduced the extent of redistribution? What are the long-term patterns across the world in income redistribution? 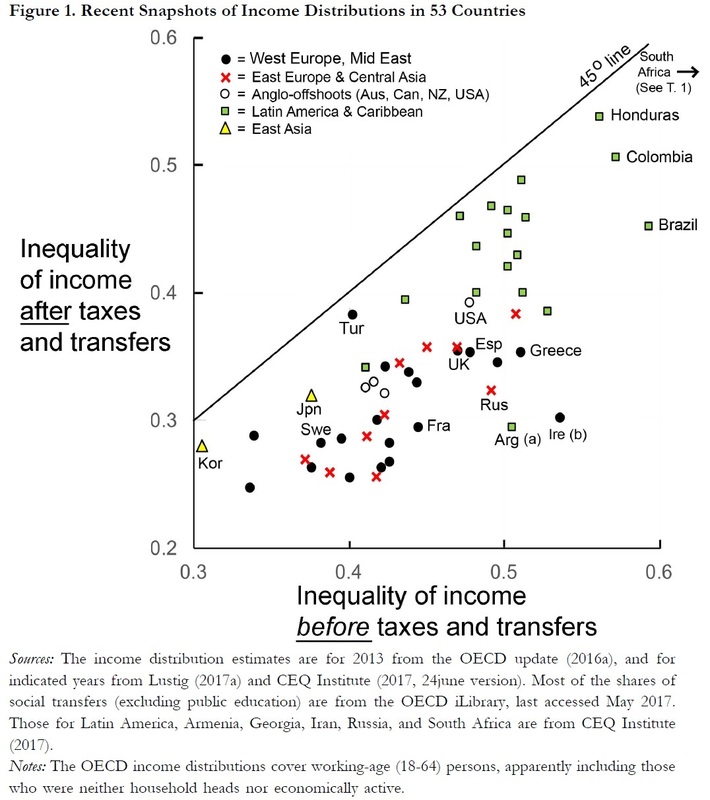 Does more redistribution happen in the more unequal countries? (1) In every country supplying adequate data, government budgets have shifted resources progressively, from the rich to the poor, within the last hundred years. Before World War I, very little was redistributed through government, mainly because government was so small, due in turn to poverty, lack of state capacity, and lack of mass suffrage. (2) For all that has been written about a shift of political sentiments and government policy away from progressivity since the late 1970s, no such trend is clear yet, pending research on more countries. A slow sustained rise in progressivity shows up in data from the United States, Argentina, and Uruguay. Among democratic welfare states, the closest thing to a demonstrable reversal against Robin Hood is the slight retreat in Sweden since the 1980s. Globally, the most dramatic swing since the late 1970s has been Chile’s record-setting return toward progressivity after the regressivity of Pinochet. (3) Adding the effects of rising public education subsidies on the later equalization of adult earning power strongly suggests that a fuller, longer-run measure of fiscal incidence would reveal a history of still greater shift toward progressivity. This revision has its greatest impact in Japan, Korea, and Taiwan, which have excelled in raising lower ranks’ earning power through primary and secondary education, but have offered little in direct transfers to the poor. (4) Finding that redistribution of government budgets has continued to march slowly toward progressivity carries a strong implication for our interpretation of the rise in income inequality since the 1970s, so firmly established by the World Top Incomes Project and by Thomas Piketty (2014). That rise may owe nothing to a net shift in government redistribution toward the rich, despite the lowering of top tax rates. If so, it is all the more important to explore what non-fiscal forces have widened gaps in market incomes around the world. (5) The stability or slow advance in net fiscal progressivity since the late 1970s has not matched the rise in overall social transfers, because less-progressive public pension benefits have risen as a share of transfers, and of GDP, in most countries. That is, social insurance policy has betrayed a mission drift away from investing in children and working-age adults, and toward accepting rising pension bills. This mission drift toward the elderly implies a missed opportunity for pro-growth leveling of income. Let me add few points from the main text of the paper that seemed worth reemphasizing. Here's a figure showing the extent inequality before redistribution (shown on the horizontal axis) and after redistribution (shown on the vertical axis). The upward-sloping line shows what would happen if redistribution was zero; thus the fact that all countries are below the line shows that inequality is lower after tax and spending policy than before. 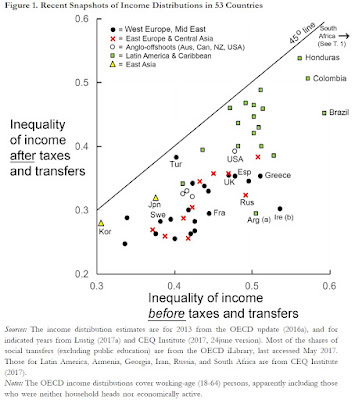 For example, you can see in the upper right that Honduras, Colombia, and Brazil all started with similar levels of inequality, but Brazil did more to redistribute income. Indeed, many of the "green box" Latin American countries have relatively high levels of inequality to start, and do relatively little about it. At the lower left, countries like Korea and Japan started of with relatively low levels of inequality, and also did relatively little to reduce inequality (that is, the points are close to the upward-sloping line). The "black dot" countries of western Europe started with middling levels of inequality, and did a lot of redistribution. The US starts with a somewhat above-average level of inequality, and makes a below-average effort to reduce it. Public spending on education affects the inequality of later pre-fisc earnings, and the progressivity of government’s contribution to reducing that inequality, through two channels. One is that a rise in inequality of adults’ accumulated schooling should directly widen the inequality of their earnings. The other is that a rise in their average schooling should bid down skilled-wage premiums, again reducing the inequality of earnings or of income. While it is not easy to trace these inequalities in education subsidies and in final earnings, this strong link should be pursued, given that the international literature on social rates of return to schooling shows consistently high average rates." Lindert lays out a range of categories for the relationship between education and inequality over time. In particular, he emphasizes looking at the ratio of spending per pupil on tertiary education vs. spending per pupil on preschool and primary education. In countries with universal education, like most high-income countries, this ratio is relatively low. In countries of Latin America that have historically tended to fund college education for the well-to-do, and not much primary education for everyone else, this ratio looks pretty high. "What trend can we foresee in this political mission drift toward favoring the elderly? The elderly share of the adult population will continue to rise. This demographic fact of life has a clear implication for providing for old age: As the share of elderly rises, their annual benefits past the age of 65 should not rise as fast as the average annual incomes of those of working age. "This clear warning ... does not mean pensions have to drop in real purchasing power. Pensions should still keep ahead of the cost of living – it’s just that they cannot grow as fast as earned incomes per person of working age, which historically grow at about 1.8 percent a year, adjusting for inflation. ... Thus as long as consumption per elderly person keep in step with wage and salary rates, population aging threatens to raise the share of GDP devoted to subsidizing the elderly. To avoid paying for this with an upward march in tax rates, or with cutbacks in public spending on more productive – and progressive -- investments in the young, society needs to trim the relative generosity of annual pension subsidies." There are many possible takeaways from this analysis, but here are a few of mine: 1) The growth of economic inequality around the world is mainly about economic factors, not a political retreat from redistribution. 2) In the longer-term, addressing the underlying forces that generate inequality--in particular, unnecessarily high inequality of educational opportunity and achievement--is a powerful force. 3) Helping the elderly more is going to be increasingly popular for politicians, but a tradeoff is that it becomes harder to make social investments that will pay off in the long term. One of the ongoing puzzles of the US economy in recent decades is why inflation has stayed so low. Even outgoing Fed Chair Janet Yellen has highlighted this puzzle. The "Amazon effect" may be part of the answer: basically, the Amazon effect is that a higher level of competitive pressure from the rising level of on-line retail sales is holding back price increases that might otherwise have occurred. 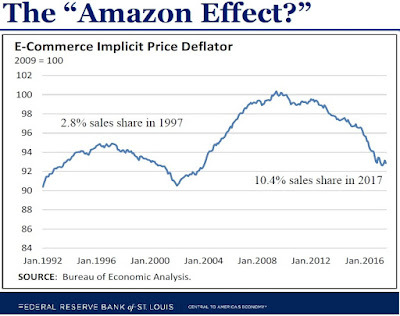 Here's a figure illustrating the potential force of the Amazon effect, put together by Kevin L. Kliesen at the St. Louis Fed. As the captions above the blue line show, e-commerce was 2.8% of retail sales, but has now risen to 10.4%. The blue line itself shows the price level for those items purchased via e-commerce, using 2009 as a base year. For example, from 2000 to 2009 this price index rose from a little above 90 to 100, implying an inflation rate for these goods of about 1% per year. But since 2009, the price index for goods purchased via e-commerce has actually been declining by about 1% per year. It's interesting to consider the possibility that the falling prices for e-commerce retail may not be a pure deflation of prices. It might also reflect cost savings delivered because buying through increasing automated warehouses is becoming more cost-efficient, compared with standard wholesale and retail product chains. For those who want details on this price index, it's the is the price deflator for “Electronic Shopping/Mail-Order Houses” produced by the US Bureau of Economic Analysis. It's in Table 7U. Chain-Type Price Indexes for BEA Retail and Food Services Sales, available here. Of course, a 1% annual price decline on 10% of retail sales cannot, by itself, explain why overall inflation for the entire economy has remained so low. But if you allow for the possibility that e-commerce prices can also place pressure on bricks-and-mortar retailers to limit their own price increases, the Amazon effect could be a meaningful part of an overall explanation. 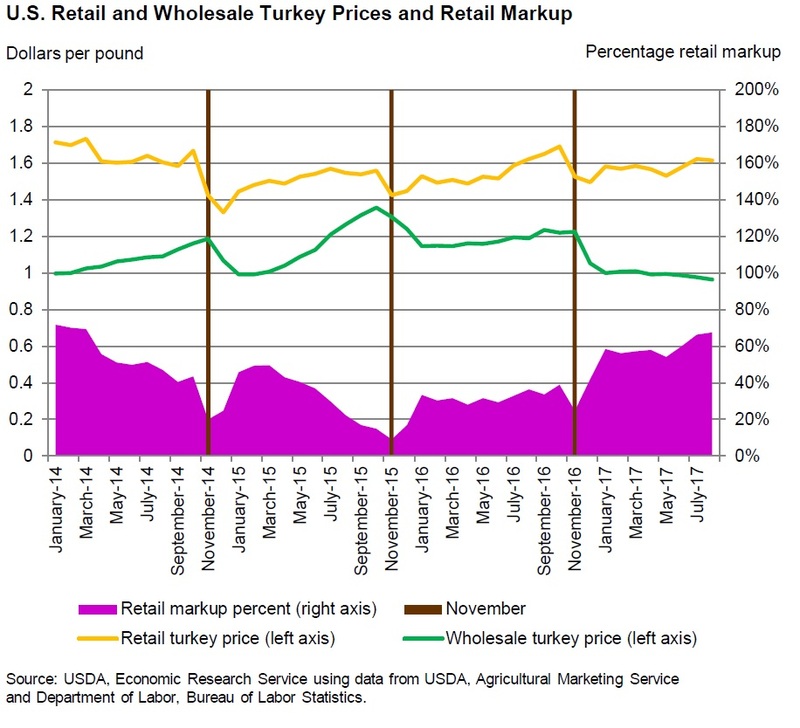 On the demand side, the quantity of turkey per person consumed rose dramatically from the mid-1970s up to about 1990, but then declined somewhat, but appears to have made a modest recovery in the last couple of years The figure below is from the Eatturkey.com website run by the National Turkey Federation. "For several decades, the number of turkey hatcheries has declined steadily. During the last six years, however, this decrease began to slow down. As of 2013, there are 54 turkey hatcheries in the United States, down from 58 in 2008, but up from the historical low of 49 reached in 2012. The total capacity of these facilities remained steady during this period at approximately 39.4 million eggs. The average capacity per hatchery reached a record high in 2012. During 2013, average capacity per hatchery was 730 thousand (data records are available from 1965 to present)." U.S. agriculture is full of examples of remarkable increases in yields over perionds of a few decades, but they always drop my jaw. I tend to think of a "turkey" as a product that doesn't have a lot of opportunity for technological development, but clearly I'm wrong. 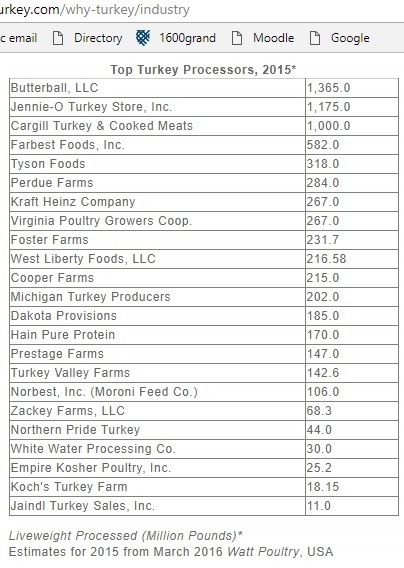 Here's a graph showing the rise in size of turkeys over time from the 2007 report. 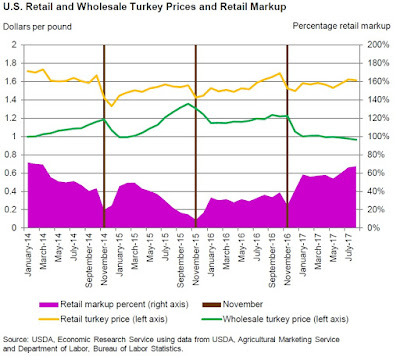 Given this reasonably competitive environment, it's interesting to note that the price markups for turkey--that is, the margin between the wholesale and the retail price--tend to decline around Thanksgiving, which obviously helps to keep the price lower for consumers. Mildred Haley of the US Department of Agriculture spells this out in the "Livestock, Dairy, and Poultry Outlook" report of October 2017. 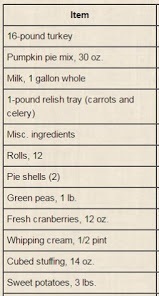 The vertical lines in the figure show that the markups clearly fall around Thanksgiving. (Highly Pathogenic Avian Influenza): for discussion of the 2015 outbreak, see the November 17, 2015 issue of the "Livestock, Dairy, and Poultry Outlook" from the US Department of Agriculture, Kenneth Mathews and Mildred Haley offer some details. But for Thanksgiving 2017, supply seems to have remained strong and turkey prices are down a bit. The cost of buying the Classic Thanksgiving Dinner actually declined by a bit in 2017, falling to $49.12 from $49.87 in 2016. The top line of the graph that follows shows the nominal price of purchasing the basket of goods for the Classic Thanksgiving Dinner. The lower line on the graph shows the price of the Classic Thanksgiving Dinner adjusted for the overall inflation rate in the economy. The line is relatively flat, which means that inflation in the Classic Thanksgiving Dinner has actually been a pretty good measure of the overall inflation rate. As I prepare for a season of pumpkin pie, pumpkin bread (made with cornmeal and pecans), pumpkin soup (especially nice wish a decent champagne) and perhaps a pumpkin ice cream pie (graham cracker crust, of course), I have been mulling over why the area around Peoria, Illinois, so dominates the production of processed pumpkin. The facts are clear enough. As the US Department of Agriculture points out (citations omitted): In 2016, farmers in the top 16 pumpkin-producing States harvested 1.1 billion pounds of pumpkins, implying about 1.4 billion pounds harvested altogether in the United States. Production increased 45 percent from 2015 largely due to a rebound in Illinois production. Illinois production, though highly variable, is six times the average of the other top eight pumpkin-producing States (Figure 2). U.S. are produced within a 90-mile radius of Peoria, Illinois. Most of those pumpkins are grown for processing into canned pumpkins. Ninety-five percent of the pumpkins processed in the United States are grown in Illinois. Morton, Illinois just 10 miles southeast of Peoria calls itself the `Pumpkin Capital of the World.'" Why does this area have such dominance? Weather and soil are part of the advantage, but it seems unlikely that the area around Peoria is dramatically distinctive for those reasons alone. This also seems to be a case where an area got a head-start in a certain industry, established economies of scale and expertise, and has thus continued to keep a lead. The Illinois Farm Bureau writes: "Illinois earns the top rank for several reasons. Pumpkins grow well in its climate and in certain soil types. And in the 1920s, a pumpkin processing industry was established in Illinois, Babadoost [a professor at the University of Illinois] says. Decades of experience and dedicated research help Illinois maintain its edge in pumpkin production." According to one report, Libby’s Pumpkin is "the supplier of more than 85 percent of the world’s canned pumpkin." The farm price of pumpkins varies considerably across states, which suggests that it is costly to ship substantial quantities of pumpkin across moderate distances. For example, the price of pumpkins is lowest in Illinois, where supply is highest, and the Illinois price is consistently below the price for other nearby Midwestern states. This pattern suggests that the processing plants for pumpkins are most cost-effective when located near the actual production. Finally, although my knowledge of recipes for pumpkin is considerably more extensive than my knowledge of supply chain for processed pumpkin, it seems plausible that demand for pumpkin is neither the most lucrative of farm products, nor is it growing quickly, so it hasn't been worthwhile for potential competitors in the processed pumpkin market to try to establish an alternative pumpkin-producing hub somewhere else. Will Artificial Intelligence Recharge Economic Growth? There may be no more important question for the future of the US economy than whether the ongoing advances in information technology and artificial intelligence will eventually (and this "eventually" is central to their argument) translate into substantial productivity gains. Erik Brynjolfsson, Daniel Rock, and Chad Syverson make the case for optimism in "Artificial Intelligence and the Modern Productivity Paradox: A Clash of Expectations and Statistics" (NBER Working Paper 24001, November 2017). The paper isn't freely available online, but many readers will have access to NBER working papers through their library. The essay will eventually be part of a conference volume on The Economics of Artificial Intelligence. Brynjolfsson, Rock, and Syverson are making several intertwined arguments. One is that various aspects of machine learning and artificial intelligence are crossing important thresholds in the last few years and the next few years. Thus, even though we tend to think of the "computer age" as having already been in place for a few decades, there is a meaningful sense in which we are about to enter another chapter. The other argument is that when a technological disruption cuts across many parts of the economy--that is, when it is a "general purpose technology" as opposed to a more focused innovation--it often takes a substantial period of time before producers and consumers fully change and adjust. In turn, this means a substantial period of time before the new technology has a meaningful effect on measured economic growth. As one example of a new threshold in machine learning, consider image recognition. 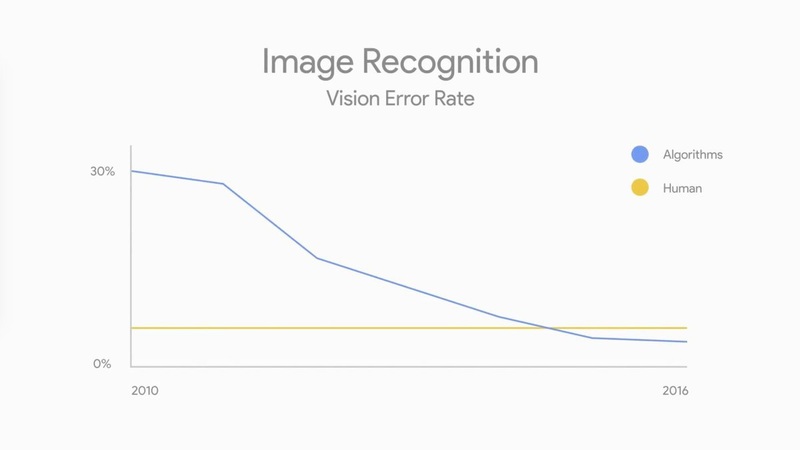 On various standardized tests for image recognition, the error rate for humans is about 5%. In just the last few years, the error rate for image-recognition algorithms is now lower than the human level--and of course the algorithms likely to keep improving. There are of course a wide array of similar examples. The authors cite one study in which an artificial intelligence system did as well as a panel of board-certified dermatologists in diagnosing skin cancer. Driverless vehicles are creeping into use. Anyone who uses translation software or software that relied on voice recognition can attest to how much better it has become in the last few years. [Artificial intelligence] machines have a new capability that no biological species has: the ability to share knowledge and skills almost instantaneously with others. Specifically, the rise of cloud computing has made it significantly easier to scale up new ideas at much lower cost than before. This is an especially important development for advancing the economic impact of machine learning because it enables cloud robotics: the sharing of knowledge among robots. Once a new skill is learned by a machine in one location, it can be replicated to other machines via digital networks. Data as well as skills can be shared, increasing the amount of data that any given machine learner can use. However, new technologies like web-based technology, accurate vision, drawing inferences, and communicating lessons don't spread immediately. The authors offer the homely example of the retail industry. The idea or invention of of online sales became practical back in the second half of the 1990s. But many of the companies founded for online-sales during the dot-com boom of the late 1990s failed, and the sector of retail that expanded most after about 2000 was warehouse stores and supercenters, not online sales. Now, two decades later, online sales have almost reached 10% of total retail. Why does it take so long? The theme that Brynjolfsson, Rock, and Syverson emphasize is that a revolution in online sales needs more than an idea. It needs innovations in warehouses, distribution, and the financial security of online commerce. It needs producers to think in terms of how they will produce, package, and ship for online sales. It needs consumers to buy into the process. It takes time. The notion that general purpose inventions which cut across many industries will take time to manifest their productivity gains, because of the need for complementary inventions, turns out to be a pattern that has occurred before. "For example, it wasn’t until the late 1980s, more than 25 years after the invention of the integrated circuit, that the computer capital stock reached its long-run plateau at about 5 percent (at historical cost) of total nonresidential equipment capital. It was at only half that level 10 years prior. Thus, when Solow pointed out his now eponymous paradox, the computers were finally just then getting to the point where they really could be seen everywhere." Going back in history, my favorite example of this lag that it takes for inventions to diffuse broadly is from the invention of the dynamo for generating electricity, a story first told by economic historian Paul David back in a 1991 essay. David points out that large dynamos for generating electricity existed in the 1870s. However, it wasn't until the Paris World Fair of 1900 that electricity was used to illuminate the public spaces of a city. And it's not until the 1920s that innovations based on electricity make a large contribution to US productivity growth. Why did it take so long for electricity to spread? Shifting production away from being powered by waterwheels to electricity was a long process, which involved rethinking, reorganizing, and relocating factories. Products that made use of electricity like dishwashers, radios, and home appliances could not be developed fully or marketed successfully until people had access to electricity in their homes. Large economic and social adjustments take time time. When it comes to machine learning, artificial intelligence, and economic growth, it's plausible to believe that we are closer to the front end of our economic transition than we are to the middle or the end. Some of the more likely near-term consequences mentioned by Brynjolfsson, Rock, and Syverson include a likely upheaval in the call center industry that employs more than 200,000 US workers, or how automated driverless vehicles (interconnected, sharing information, and learning from each other) will directly alter one-tenth or more of US jobs. My suspicion is that the changes across products and industries will be deeper and more sweeping than I can readily imagine. Of course, the transition to the artificial intelligence economy will have some bumps and some pain, as did the transitions to electrification and the automobile. But the rest of the world is moving ahead. And history teaches that countries which stay near the technology frontier, and face the needed social adjustments and tradeoffs along the way, tend to be far happier with the choice in the long run than countries which hold back. Why Has Life Insurance Ownership Declined? Back in the first half of the 19th century, life insurance was unpopular in the US because it was broadly considered to be a form of betting with God against your own life. After a few decades of insurance company marketing efforts, life insurance was transformed into a virtuous purchase for any good and devout husband. But in recent decades, life insurance has been in decline. Daniel Hartley, Anna Paulson, and Katerina Powers look at recent patterns of life insurance and bring the puzzle of its decline into sharper definition in "What explains the decline in life insurance ownership?" in Economic Perspectives, published by the Federal Reserve Bank of Chicago (41:8, 2017). The story of shifting attitudes toward life insurance in the 19th century US is told by Viviana A. Zelizer in a wonderfully thought-provoking 1978 article, "Human Values and the Market: The Case of Life Insurance and Death in 19th-Century America," American Journal of Sociology (November 1978, 84:3, pp. 591-610). With regard to recent patterns, Hartley, Paulson, and Powers write: "Life insurance ownership has declined markedly over the past 30 years, continuing a trend that began as early as 1960. In 1989, 77 percent of households owned life insurance (see figure 1). By 2013, that share had fallen to 60 percent." In the figure, the blue line shows any life insurance, the red line shows the decline in term life, and the gray line shows the decline in cash value life insurance. "Much of the opposition to life insurance resulted from the apparently speculative nature of the enterprise; the insured were seen as `betting' with their lives against the company. The instant wealth reaped by a widow who cashed her policy seemed suspiciously similar to the proceeds of a winning lottery ticket. Traditionalists upheld savings banks as a more honorable economic institution than life insurance because money was accumulated gradually and soberly. ... A New York Life Insurance Co. newsletter (1869, p. 3) referred to the "secret fear" many customers were reluctant to confess: `the mysterious connection between insuring life and losing life.' The lists compiled by insurance companies in an effort to respond to criticism quoted their customers' apprehensions about insuring their lives: "I have a dread of it, a superstition that I may die the sooner" (United States Insurance Gazette [November 1859], p. 19). ... However, as late as the 1870s, "the old feeling that by taking out an insurance policy we do somehow challenge an interview with the 'king of terrors' still reigns in full force in many circles" (Duty and Prejudice 1870, p. 3). Insurance publications were forced to reply to these superstitious fears. They reassured their customers that "life insurance cannot affect the fact of one's death at an appointed time" (Duty and Prejudice 1870, p. 3). Sometimes they answered one magical fear with another, suggesting that not to insure was "inviting the vengeance of Providence" (Pompilly 1869). ... An Equitable Life Assurance booklet quoted wives' most prevalent objections: "Every cent of it would seem to me to be the price of your life .... it would make me miserable to think that I were to receive money by your death .... It seems to me that if [you] were to take a policy [you] would be brought home dead the next day" (June 1867, p. 3)." "From the 1830s to the 1870s life insurance companies explicitly justified their enterprise and based their sales appeal on the quasi-religious nature of their product. Far more than an investment, life insurance was a `protective shield' over the dying, and a consolation `next to that of religion itself' (Holwig 1886, p. 22). The noneconomic functions of a policy were extensive: `It can alleviate the pangs of the bereaved, cheer the heart of the widow and dry the orphans' tears. Yes, it will shed the halo of glory around the memory of him who has been gathered to the bosom of his Father and God' (Franklin 1860, p. 34). ... life insurance gradually came to be counted among the duties of a good and responsible father. As one mid-century advocate of life insurance put it, the man who dies insured and `with soul sanctified by the deed, wings his way up to the realms of the just, and is gone where the good husbands and the good fathers go' (Knapp 1851, p. 226). Economic standards were endorsed by religious leaders such as Rev. Henry Ward Beecher, who pointed out, `Once the question was: can a Christian man rightfully seek Life Assurance? That day is passed. Now the question is: can a Christian man justify himself in neglecting such a duty?' (1870)." Zelizer's work is a useful reminder that many products, including life insurance, are not just about prices and quantities in the narrow economic sense, but are also tied to broader social and institutional patterns. "Instead, [life insurance] ownership has decreased substantially across a wide swath of the population. Explanations for the decline in life insurance must lie in factors that influence many households rather than just a few. This means we need to look beyond the socioeconomic and demographic factors that are the focus of our analysis. A decrease in the need for life insurance due to increased life expectancy is likely to be an especially important part of the explanation. In addition, other potential factors include changes in the tax code that make the ability to lower taxes through life insurance less attractive, lower interest rates that also reduce incentives to shelter investment gains from taxes, and increases in the availability and decreases in the cost of substitutes for the investment component of cash value life insurance." It's intriguing to speculate about what the decline in life insurance purchases tells us about our modern attitudes and arrangements toward death, in a time of longer life expectancies, more households with two working adults, the backstops provided by Social Security and Medicare, and perhaps also shifts in how many people feel that their souls are sanctified (in either a religious or a secular sense) by the purchase of life insurance. I happened to be in the United Kingdom on a long-planned family vacation on June 23, 2016, when the Brexit vote took place. At the time, I offered a stream-of-consciousness "Seven Reflections on Brexit" (June 26, 2016). But more than year has now passed, and Thomas Sampson sums up the research on what is known and what might come next in "Brexit: The Economics of International Disintegration," which appears in the Fall 2017 issue of the Journal of Economic Perspectives. Here's Sampson's basic description of the UK and its position in the international economy before Brexit. For me, it's one of those descriptions that doesn't use any weighted rhetoric, but nonetheless packs a punch. "The United Kingdom is a small open economy with a comparative advantage in services that relies heavily on trade with the European Union. In 2015, the UK’s trade openness, measured by the sum of its exports and imports relative to GDP, was 0.57, compared to 0.28 for the United States and 0.86 for Germany (World Bank 2017). The EU accounted for 44 percent of UK exports and 53 percent of its imports. Total UK–EU trade was 3.2 times larger than the UK’s trade with the United States, its second-largest trade partner. UK–EU trade is substantially more important to the United Kingdom than to the EU. Exports to the EU account for 12 percent of UK GDP, whereas imports from the EU account for only 3 percent of EU GDP. Services make up 40 percent of the UK’s exports to the EU, with “Financial services” and “Other business services,” which includes management consulting and legal services, together comprising half the total. Brexit will lead to a reduction in economic integration between the United Kingdom and its main trading partner." "The main conclusion of this literature is that Brexit will make the United Kingdom poorer than it would otherwise have been because it will lead to new barriers to trade and migration between the UK and the European Union. There is considerable uncertainty over how large the costs of Brexit will be, with plausible estimates ranging between 1 and 10 percent of UK per capita income. The costs will be lower if Britain stays in the European Single Market following Brexit. Empirical estimates that incorporate the effects of trade barriers on foreign direct investment and productivity find costs 2–3 times larger than estimates obtained from quantitative trade models that hold technologies fixed." What will come next after Brexit isn't yet clear, and may well take years to negotiate. In the meantime, the main shift seems to be that the foreign exchange rate for the pound has fallen, while inflation has risen, which means that real inflation-adjusted wages have declined. This national wage cut has helped keep Britain's industries competitive on world markets, but it's obviously not a desirable long-run solution. economic and social struggles. The former implies a fundamental opposition to deep economic and political integration, even if such opposition brings economic costs, while the later suggests Brexit and other protectionist movements could be addressed by tackling the underlying reasons for voters’ discontent." For me, one of the political economy lessons of Brexit is that relatively easy to get a majority against a specific unpopular element of the status quo, while leaving open the question of what happens next. It's a lot harder to get a majority in favor of a specific change. That problem gets even harder when it comes to international agreements, because while it's easy for UK politicians to make pronouncements on what agreements the UK would prefer, trade negotiators in the EU, the US, and the rest of the world have a say, too. Sampson discusses the main post-Brexit options, and I've blogged about them in "Brexit: Getting Concrete About Next Steps" (August 2, 2016). While the process staggers along, this "small open economy with a comparative advantage in services that relies heavily on trade with the European Union" is adrift in uncertainty. The Great Recession ended more than eight years ago, in June 2009. The US unemployment rate declined slowly after that, but it has now been below 5.0% every month for more than two years, since September 2015. Thus, an ongoing mystery for the US economy is: Why haven't wages started to rise more quickly as the labor market conditions improved? Jay Shambaugh, Ryan Nunn, Patrick Liu, and Greg Nantz provide some factual background to address this question in "Thirteen Facts about Wage Growth," written for the Hamilton Project at the Brookings Institution (September 2017). The second part of the report addresses the question: "How Strong Has Wage Growth Been since the Great Recession?" 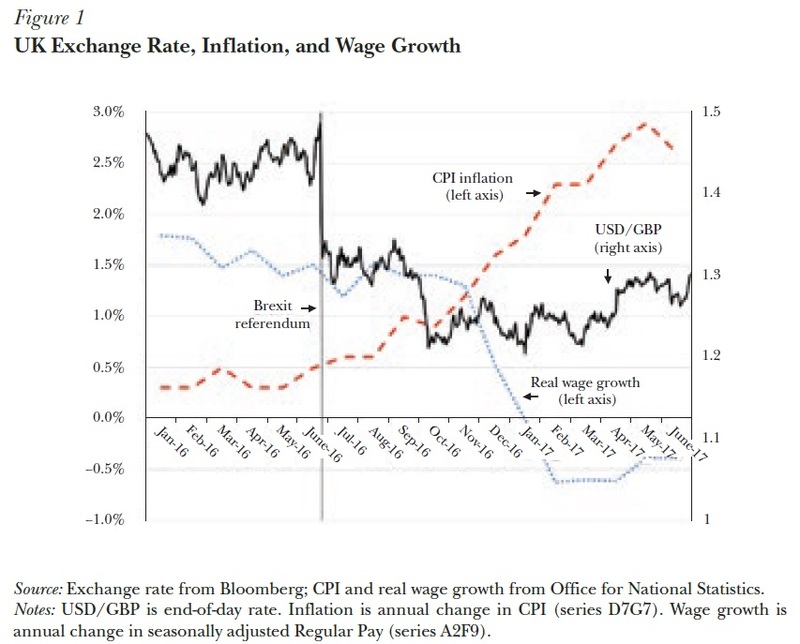 For me, one surprising insight from the report is that real wage growth--that is, wage growth adjusted for inflation--has actually not been particularly slow during the most recent upswing. The upper panel of this figure shows real wage growth since the early 1980s. The horizontal lines show the growth of wages after each recession. The real wage growth in the last few years is actually higher. 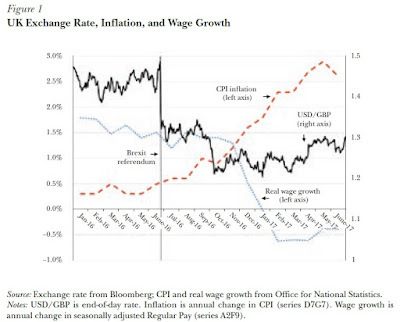 The bottom panel shows nominal wage growth, with inflation included. By that measure, wage growth in recent years is lower than after the last few recessions. Thus, I suspect that one reason behind the perception of slow wage growth is that many people are focused on nominal rather than on real wages. Government statistics offer a lot of ways of measuring wage growth. The graphs above are wage growth for "real average hourly earnings for production and nonsupervisory workers," which is about 100 million of the 150 million workers. An alternative and broader approach looks what is called the Employment Cost Index, which is based on a National Compensation Survey of employers. 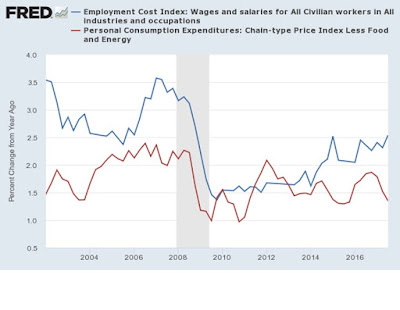 To adjust for inflation, I use the measure of inflation called the Personal Consumption Expenditures price index, which is the inflation just for the personal consumption part of the economy that is presumably most relevant to workers. I also use the version of this index that strips out jumps in energy and food prices. This is the measure of the inflation rate that the Federal Reserve actually focuses on. Economists using these measures were pointing out a couple of years ago that real wages seemed to be on the rise. 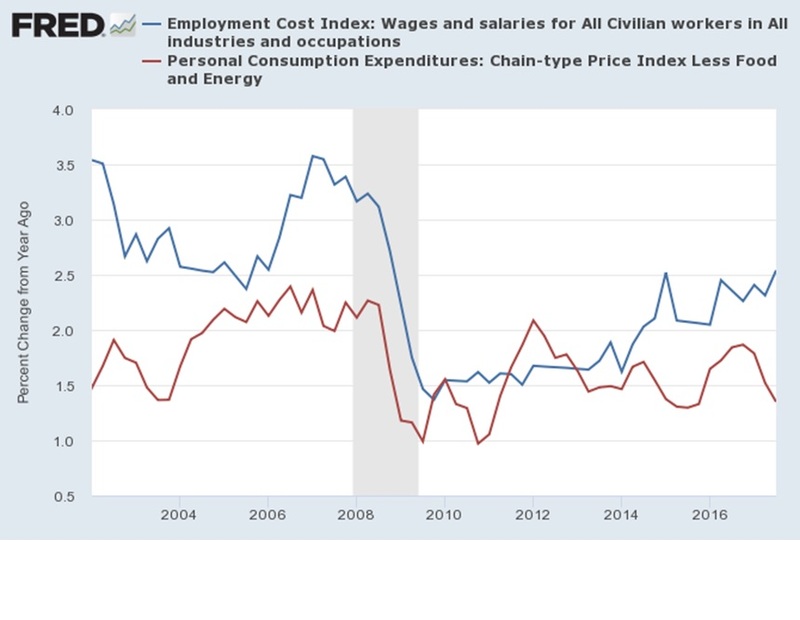 The blue line shows the annual change in wages and salaries for all civilian workers, using the ECI, while the redline shows the PCE measure of inflation. The gap between the two is the real gain in wages, which you can see started to emerge in 2015. 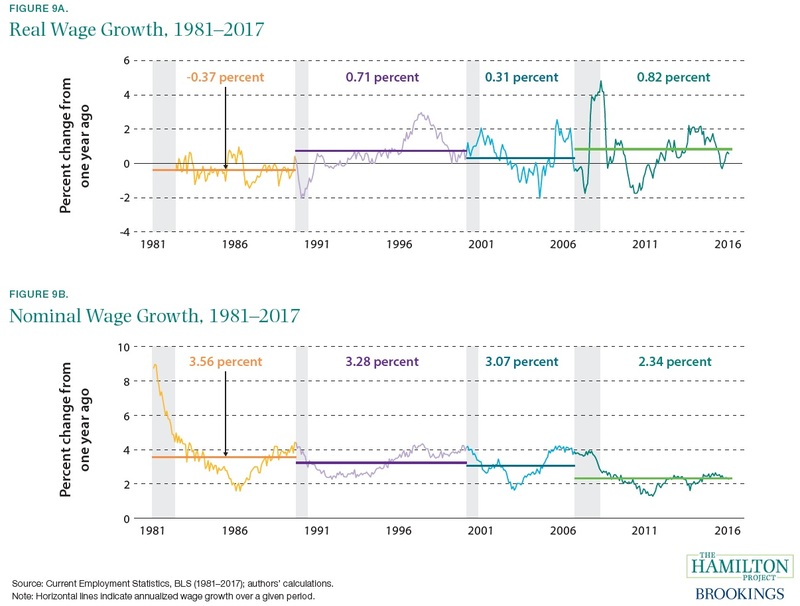 "In normal times, entrants to full-time employment have lower wages than those exiting, which tends to depress measured wage growth. During the Great Recession this effect diminished substantially when an unusual number of low-wage workers exited full-time employment and few were entering. After the Great Recession ended, the recovering economy began to pull workers back into full-time employment from part-time employment ... and nonemployment, while higher-paid, older workers left the labor force. 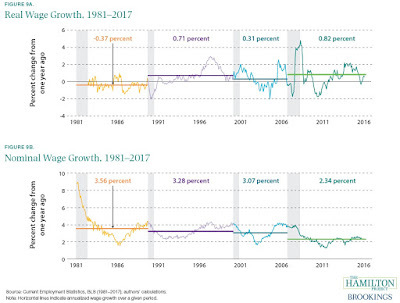 Wage growth in the middle and later parts of the recovery fell short of the growth experienced by continuously employed workers, reflecting both the retirements of relatively high-wage workers and the reentry of workers with relatively low wages. In 2017 the effect of this shifting composition of employment remains large, at more than 1.5 percentage points. If and when growth in full-time employment slows, we can expect this effect to diminish somewhat, providing a boost to measured wage growth." The baby boomer generation is hitting retirement and leaving the labor force, as relatively highly-paid workers at the end of their careers. New workers entering the labor force, together with low-skilled workers being drawn back into the labor force, tend to have lower wages and salaries. This makes wage growth look low--but what's happening is in part a shift in types of workers. 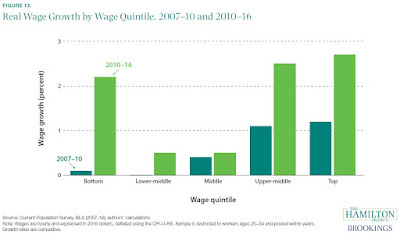 One other fact from Shambaugh, Nunn, Liu, and Nantz is that wage growth has been strong at the bottom and the top of the wage distribution, but slower in the middle. 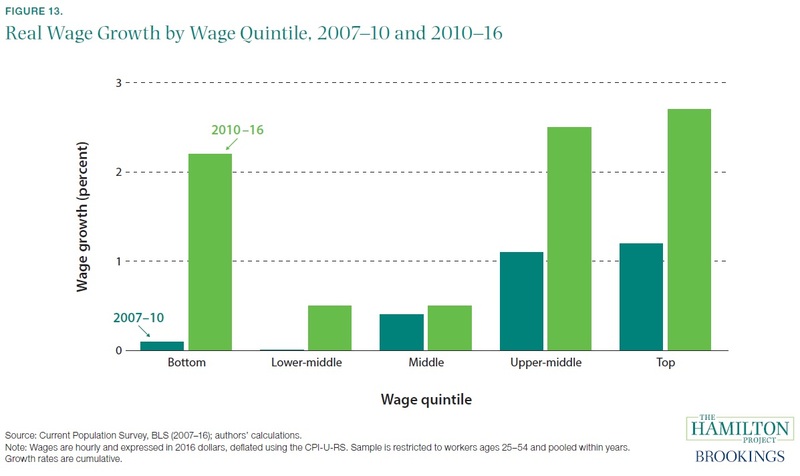 This figure splits the wage distribution into five quintiles, and shows the wage growth for production and nonsupervisory workers in each. Taking these factors together, the "mystery" of why wages haven't recovered more strongly since the end of the Great Recession appears to be resolved. However, a bigger mystery remains. Why have wages and salaries for production and nonsupervisory workers done so poorly not in the last few years, but over the last few decades? There's a long list of potential reasons: slow productivity growth, rising inequality, dislocations from globalization and new technology, a slowdown in the rate of start-up firms, weakness of unions and collective bargaining, less geographic mobility by workers, and others. These factors have been discussed here before, and will be again, but not today. Shambaugh, Nunn, Liu, and Nantz provide some background figures and discussion of these longer-term factors, too. "There has been more convergence between poor people in poor countries and rich people in rich countries over the last generation than in any generation in human history. The dramatic way to say it is that between the time of Pericles and London in 1800, standards of living rose about 75 percent in 2,300 years. They called it the Industrial Revolution because for the first time in human history, standards of living were visibly and 2 meaningfully different at the end of a human lifespan than they had been at the beginning of a human lifespan, perhaps 50 percent higher during the Industrial Revolution. Fifty percent is the growth that has been achieved in a variety of six-year periods in China over the last generation and in many other countries, as well. And so if you look at material standards of living, we have seen more progress for more people and more catching up than ever before. That is not simply about things that are material and things that are reflected in GDP. ... [I]f current trends continue, with significant effort from the global community, it is reasonable to hope that in 2035 the global child mortality rate will be lower than the US child mortality rate was when my children were born in 1990. That is a staggering human achievement. It is already the case that in large parts of China, life expectancy is greater than it is in large parts of the United States." "I remember as a young economist who was going to be the chief economist of the World Bank sitting and talking with Stan Fischer, who was my predecessor as the chief economist of the World Bank. And we were talking, and I was new to all this. I had never done anything in the official sector. And I said, "Stan, I don't get it. If a country has five infrastructure projects and the World Bank can fund two of them, and the World Bank is going to cost-benefit analyze and the World Bank is going to do all its stuff, I would assume what the country does is show the World Bank its two best infrastructure projects, because that will be easiest, and if it gets money from the World Bank, then it does one more project, but what the World Bank is actually buying is not the project it is being shown, it is the marginal product that it is enabling. And so why do we make such a fuss of evaluating the particular quality of our projects?" And Stan listened to me. And he looked at me. He's a very wise man. And he said, "Larry, you know, it is really interesting. When I first got to the bank, I always asked questions like that." "But now I've been here for two years, and I don't ask questions like that. I just kind of think about the projects, because it is kind of too hard and too painful to ask questions like that." "[O]ur money—and I mean by that our assistance and the assistance of the multilateral institutions in which we have great leverage—is much less significant than it once was. Perhaps the best way to convey that is with a story. In 1991, when I was new to all of this, I was working as the chief economist of the World Bank, and the first really important situation in which I had any visibility at all was the Indian financial crisis that took place in the summer of 1991. And at that point, India was near the brink. It was so near the brink that, at least as I recall the story, $1 billion of gold was with great secrecy put on a ship by the Indians to be transported to London, where it could be collateral for an emergency loan that would permit the Indian government to meet its payroll at the end of the month. And at that moment, the World Bank was in a position over the next year to lend India $3 billion in conjunction with its economic reform program. And the United States had an important role in shaping the World Bank's strategy. Well, that $3 billion was hugely important to the destiny of a sixth of humanity. Today, the World Bank would have the capacity to lend India in a year $6 billion or $7 billion. But India has $380 billion—$380 billion—in reserves dominantly invested in Treasury bills earning 1 percent. And India itself has a foreign aid budget of $5 billion or $6 billion. And so the relevance of the kind of flows that we are in a position to provide officially to major countries is simply not what it once was." "[T]he current WHO budget for pandemic flu is less than the salary of the University of Michigan's football coach—not to mention any number of people who work in hedge funds. And that seems manifestly inappropriate. And we do not yet have any settled consensus on how we are going to deal with global public goods and how that is going to be funded."